Walking up to the annual Randolph Street Market, eyeing a wide variety of paintings lining the festival gate, I was instantly exposed to a variety of fantastic pieces. I knew that there were going to be vast quantities of vintage goodies for the browsing. The annual festival takes places in the rather roomy parking lot of the Plumbing Industry Center and the Chicago Journeymen Plumbing building, which also houses some of the vendors. The outdoor area held almost all of the furniture vendors along with some vintage clothing and jewelry vendors as well. The furniture shown at the market this year ranged from exquisitely reserved to perfectly weathered. Every decade of the twentieth century had strong representation, my favorite item was a 1960s patio cart that boasted of a Ronald Reagan endorsement. Some if not most pieces are not in mint condition, but restored for sale by vendors. You won’t find any rough pieces needing extreme TLC. As I walked up and down the aisles of tents, I found that some of the best products were the cultural artifacts. There was furniture and some clothing as expected, but there were also a variety of different records, vintage posters, old signs, and other novelty items from the past. Key finds: classic Four Tops records and swoon worthy 1940s Doc Savage comics. Enough shopping, time to eat—but I was worried as I had only seen a hot dog stand and as a vegetarian, that wasn’t going to cut it. But as I moved closer to the interior of the festival, there were delicious options aplenty. Bloody Marys for my festival companion. Plus vendors for crepes, empanadas, and a vegetarian stand called Antique Kitchen—I had their Pita Pizza, which was simple, yet heavenly. It was also great to have ample seating outdoors. Nothing like sharing a table with your fellow vintage shoppers bragging about your exciting finds. As it got rainy, I moved into a packed Plumbing Union building which featured an area inside where designers could show their work. Upstairs in the auditorium area, stunning vintage accessories and clothing filled the area from the likes of Saffron Vintage (a collection of designer vintage clothing from New York musician turned vintage connoisseur Marydee Reynolds). Seeing classic YSL and Chanel pieces was exciting, even better was talking to Marydee about them. 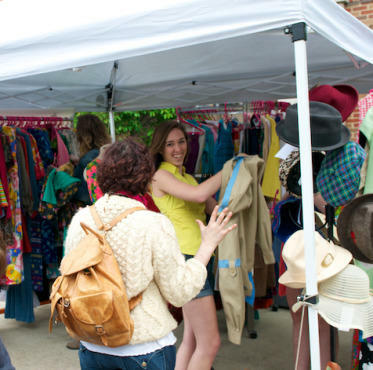 Fest-goers agreed that the vendors themselves are part of the draw at Randolph Street Market—and worth the $10 admission. “Every time I come I feel the overwhelming need to purchase something strictly because of the passion the sellers have for their products,” a shopper named Karen told me. That makes the shopping experience a thrill, but also more dangerous for the bank account. You have been warned. Randolph Street Market returns June 25-26.